Tony Yeboah scores his wonder goal against Liverpool in 1995. As with any truly great goal, there’s a moment when the world holds its breath. It’s a barely a moment, a nanosecond perhaps, the flicker in time just before boot hits ball. It’s in that flicker of time that time stands still and you wonder; surely not? It happened as the ball dropped over Tony Yeboah’s shoulder against Liverpool in 1995 and it happened as he jinked past a rabble of hapless Wimbledon defenders; a sea of white held its breath. Could he? Tony Yeboah celebrates scoring against Wimbledon in 1995. Photo: Getty Images. In the space of a month, the Ghanaian, who turns 52 on Wednesday, produced two of the most iconic strikes the club has ever seen – some would argue the top two. Sleeves rolled halfway up the forearm, he had a way of dropping his shoulder, of hammering the ball with barely any backlift, that the Elland Road faithful fell in love with early on. His was an effortless class. Whatever ‘it’ was, he had it by the bucketful. Yeboah arrived shrouded in mystery. A £3.5m transfer from Eintracht Frankfurt in January 1995, he was one of a number of exciting foreign signings bought by Premiership clubs with Sky TV’s Premier League riches. Unlike many of them, including Thomas Brolin, Yeboah proved to be worth every penny – he rocked up mid-season, finished as the Whites top scorer and fired them into the UEFA Cup. The signing was rushed through after a fallout between Yeboah and the soon-to-be legendary then-Frankfurt boss Jupp Heynckes. Wilkinson and Leeds moved fast to make it happen, the manager admitting that he hadn’t seen him kick a ball in the flesh until after the deal was done. Yeboah later admitted that he had found English football intimidating early on, not that it showed. He immediately endeared himself to West Yorkshire by scoring 10 goals in 10 games, including a whirlwind hat-trick against relegation-bound Ipswich. It was that triple led the famously unflappable Howard Wilkinson to describe his new forward as ‘world class’. He’d go on to blitz two more for Leeds – when he was good, he was unplayable and inside a few short months he had transformed Leeds into an attacking force to be reckoned with. 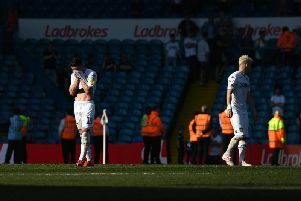 Leeds United 1 Wigan 2 - talking points: Decisive Easter Monday, penalty problem and should Marcelo Bielsa really blame himself? It was during his second season that those famous goals arrived, the first an impossibly well struck volley in a 1-0 win over Liverpool, the second barely a month later, hypnotising a defence against Wimbledon. ‘Surely not?’ moments they both were, and with Yeboah firing and Leeds winning five of their first eight, the Ghana man had Elland Road bouncing. It was no coincidence that the side’s form nosedived as Yeboah struggled with form and fitness. In the second half of the season they secured just three wins, but where anything good happened to Leeds that season, Yeboah was invariably right at the heart of it. Their solo win in the UEFA Cup, a 3-0 drubbing of Monaco, featured a Yeboah hat-trick. He scored goals in each of the League Cup semi-final wins over Birmingham, and blasted two in a rare late-season win against Coventry. Talismanic doesn’t cover it. With Wilkinson out and the defensive-minded disciplinarian George Graham as his replacement, Yeboah’s contributions became restricted. He would make only six appearances under the Scot and was sold on to Hamburg in September 1997, the Leeds love affair cut short, his once-promised club legend status reduced to a cult role. The YouTube videos are on repeat for many Leeds fans. Dorigo forward, onto the head of Brian Deane.. Surely not?